During the 2 days trip we visit this two wineries. And I really recommend if someday you want to visit La Rioja’s wineries to visit this two because there are totally different and even opposite. Lopez Heredia is one of the oldest winery of La Rioja and it is the region’s representation for traditional way of producing wine. Campo Viejo is just the opposite; it is representative for modernity and the last wine technology. These two wineries really challenged two of my senses: the smell and the taste, and in a second place the view (as I heard some interesting stories of the wine industry). My travel experience has taught me that each person leaves differently his travel experience, as our past life experiences and also the places we visit before influence in our travel experience in the new destination. And that’s why for me the trip to this wineries was special because some smells, tastes and stories were totally new for me and at the some times other smells and stories brought to my mind some childhood memories. But now I’ll start to describe you how was my visit to each winery. I’ll start with Bodegas López Heredia. I specially enjoyed the visit to this winery. Mercedes, the person who owns the winery, received us and was our guide. She explained us all the process of the wine production and was a great driver of the time machine that took us in a travel which started back in time, at the origin of the winery and finished on 16th December (the day we made the visit). The way she storied the history of Lopez Heredia winery and the traditional process of the production of Viña Todonia, was transmitting her love to the winery and for the family wine tradition. 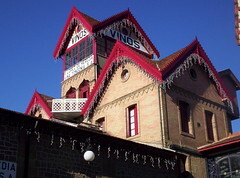 Viña Todonia is the most famous wine produced by López Heredia. Those who are Spanish speakers can discover the origins of the name Todonia, exactly as Mercedes told us, in a video made by Jimmy Pons during our visit. If you don’t understand Spanish, from Jimmy’s videos, you can found out how to open an old Viña Todoña bottle. But if you do understand Spanish I recommend you to watch the three videos made by Jimmy during the visit to López Heredia, that you can find in the Youtube channel turismoenlarioja . The first thing that captures your attention when you arrive to López Heredia, is the architecture of the winery. 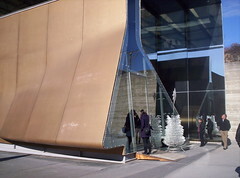 Most part of this architecture is old but the shop is very modern and was designed by the famous architect, Zaha Hadid. So don’t forget your money, if you don’t want to pass the occasion of buying a good bottle of wine in this shop!!! When I entered in the winery, the smell of wine melt with the smell of wood and a strange smell of old remind me the very small cellar, where one of my grand fathers kept his small production of wine in South Romania. It was exactly the same smell. In López Heredia the wine barrels are handmade, in the old Spanish manner. 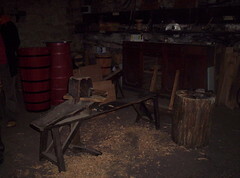 And I was quite surprise to discover in the winery’s carpentry workshop, similar tools used by my other grand father from Apuseni Mountains (West Carpathian Mountains) to make barrels and other handmade work on wood. We had the lunch here, with Mercedes. Eating in a winery of Rioja is an incredible experience. You discover La Rioja’s gastronomy while you smell and taste a large variety of wine; as in this region to each dish you are given a different wine. I’ve never tasted and smelled so many wines as I did in this trip. Tirso Maldonado, also wrote a review about Lopez Heredia in his TravBuddy Blog. You can discover here his post and photos Visita Bodega López Heredia. In the next entry I will share with you my experience in the visit to Bodegas Campo Viejo.